Today marks what would have been Lennox’s eleventh birthday. 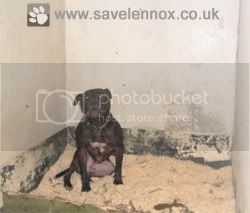 Lennox, born on April 1st 2005 would never know just how important a role he would play in his later life but unfortunately he also did not know that he would have to pay the ultimate price to become such an important figure the world over. Lennox taught the world about Breed Specific Legislation on July 11th 2012 after spending almost three years in a lonely concrete cell away from his loving family and never to be allowed a visit from his family or the little girl who had spent everyday of her life with him until he was torn away from her, Lennox was then cruelly murdered by a corrupt Belfast City Council helped in court by the continual lies from an untrained, evil and despicable dog warden that does not deserve having her notorious name mentioned in this post and the untrained, unqualified rubbish spewed by a self proclaimed expert called Peter Tallack. Today we remember Lennox on his birthday and also all those other innocent souls who have fell victim to an outdated cruel law known as Breed Specific Legislation. Lennox will never be forgotten for the beautiful soul he was, a brave yet gentle, loving and happy dog until his murder in 2012. Lennox’s family, friends and global supporters will always remember Lennox and also never forget those that tortured then finally murdered him simply to punish a family for speaking out against them. On your 11th birthday Lennox, you are loved, you are remembered! Should Belfast City Council Be Thoroughly Investigated By An Independent Body Due To Their Animal Welfare Failings? 5 Years On & The Pain Remains! vR.6.3 The Lennox Campaign Website, Branding Logo & All Content Is Copyright Registered © 2010 - 2016 The Lennox Campaign. All Rights Reserved.